Fidget spinners at school have become a hot topic in the world of education. Anyone who has been in a classroom in the past few months has seen them. It’s amazing how trends seem to just pop up and rise in popularity overnight, and fidget spinners are no exception. The sooner we accept their presence in our classrooms, the sooner we can start making reasonable parameters for when their use is acceptable, or not. Should teachers allow fidget spinners in the classroom? As with any trend that comes into the classroom, we must evaluate whether fidget spinners are appropriate to have in a lesson. Let’s face it, many students do benefit from having some kind of fidget toy in the classroom, and spinners should be treated just like anything else. 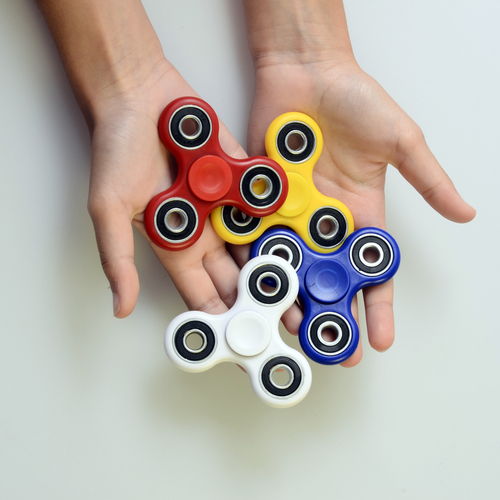 If a student can use a spinner properly, without becoming a distraction to their friends or making unnecessary noise, perhaps they should be allowed to have one in class. Of course, if the teacher finds it personally distracting, perhaps they can ask the student to find a less distracting alternative. Who should be allowed to have a fidget spinner in school? The same issues that arise with all personal property at school are certainly applicable to fidget spinners as well. Particularly in elementary schools, the loss or theft of a fidget spinner during the school day can cause considerable drama for the owner. If spinners are allowed in school, teachers need to be ready to deal with the fallout when they are lost, stolen or misplaced. A distraught and inconsolable student can become a huge distraction to everyone, and cause interpersonal strife amongst the students. If you choose to allow fidget spinners at school, you need to think about who is allowed to have them, and when. Perhaps the easiest solution is just to prohibit them during lessons, and only let students take them out during breaks. However, this might not be the right solution for everyone. Spinners were invented to help students who are having a hard time focusing release excess energy, and do something small on the side that will help them pay better attention in the lesson. There might be some students, particularly those who need to move around and have a hard time sitting through lessons, who can really benefit from having a fidget spinner in the lesson. Teachers can decide that spinners are allowed for some students, yet forbidden for others. How do you use a fidget spinner? A fidget spinner is like a mini propeller. You hold the middle and spin the outside part. They come in many sizes, styles and colors, but the basic design is usually the same. The idea is that while you are spinning the spinner, you can still pay attention to what is going on around you, but you don’t feel the need to move around as much, because you are focusing on spinning the spinner as well. If it works, and really does promote increased focus, this is a reason to allow, and maybe even promote, fidget spinners in school. As with any decision about what to allow in the classroom, every educator has to choose what is right for them, unless there is a school policy in place. Fidget spinners can cause a lot of drama and become a distraction, but they can also be used for their intended purpose and help students stay more focused in the lesson. The most important thing is to pay attention to how they are affecting you and your students, and then adjust your policy and expectations accordingly.